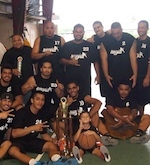 The American Samoa Basketball Federation have submitted a 26-name preliminary squad for the upcoming 2007 South Pacific Games which will be held in Apia, Samoa. The squad features Ata Perese and Vailili Malauulu, the leaders of the U21 team in the last FIBA Oceania Youth Tournament. Five players are born in America and the country is a mix of samoan, american samoan and american citizens! Of course, they are all elligible to play with the American Samoa in this tournament. The most surprising player is Samuelu Fuimaono, who is living in Andorra, a small European country between France and Spain!